Sound damping, squeak reduction and vibration absorbing tapes fill the gaps and spaces in and around RV components to allow for a smoother, quieter environment in transit. LAMATEK stocks a wide variety of substrates for all of your vibration damping and noise reduction needs. Choose from our stocked materials like PVC vinyl foam, high density urethane, vinyl nitrile and neoprene rubber sponge or talk to a sales representative to find out which tape meets your exact specification. Our foam cushioning tapes are available with high-tack rubber or permanent acrylic adhesive options. 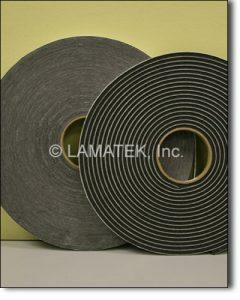 Anti-rattle tapes are provided slit to width on 3” core tubes, typically with a white paper liner. Several of our squeak reduction and anti-rattle tapes are already tested and proven effective for use in portable home construction and recreational vehicles.